A simple galette, a flat sweet or savory tart, is a go-to dish I rely on for special occasions and everyday meals. 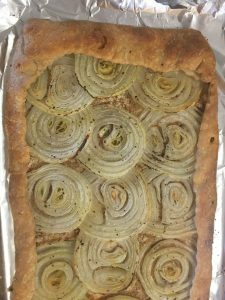 For this Onion Galette, I’ve adapted my favorite dough recipe from Jacques Pepin’s Art of Cooking to feature stone ground whole wheat flour and sesame seeds. When rolled out thin and baked, it’s good enough to eat on its own as a savory cracker. A layer of onions adds some sweetness and gives me the excuse to eat an extra slice or two. (“It’s a good vegetable,” as Jacques would say.) If you can find small red onions, use them. They look stunning. 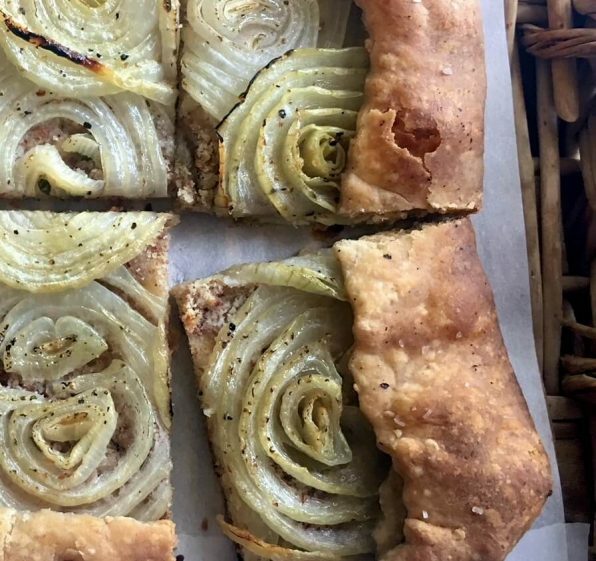 Serve the galette with a salad and a glass of wine. Or make the galette into a more substantial first course. Use more onions; it could take half again as many slices as I use here. Or alternate thin slices of tomato and zucchini with the onions. Sprinkle the crust with crumbled goat cheese or grated Gruyère before you add the onion slices. September is National Whole Grain Month and a good time to look for ways to eat more unrefined grains. I’m always swapping out whole wheat for some percentage of the white flour in my recipes. You can substitute whole wheat for 20% of the all-purpose white flour in most recipes. We keep a pantry stocked with farro, spelt and wheat berries as well as steel-cut oats and amaranth. If you are ever confused by what truly constitutes a good source of whole grains, visit the website of the Whole Grains Council. They do a terrific job explaining the difference between whats a whole grain, a refined grain and more. 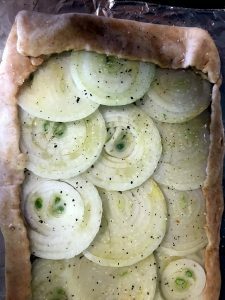 If you are curious about how many onions to use in this recipe, here is the galette before baking. You can see how the slices are tightly overlapped. And here it is after baking. The slices have shrunk and more of the bottom crust shows through. Ground almonds sprinkled on the dough before baking absorb any juices from the onions. You can see specks of almonds peeking through, a nice addition to the flavor too. To make the Sesame Whole Meal Crust: Combine the flours, salt and sesame seeds in the bowl of a food processor fitted with the metal blade. Cut the butter into 12 pieces and add them to the flour mixture. Process the dough for 15 to 20 seconds. The butter will be in irregular pieces. Add the water and pules just until the dough starts to come together. Add the cold water and pulse for 15 to 20 more seconds. Dump the dough into a mixing bowl. Gather it into a ball. Cover and refrigerate for an hour or longer. To make the Onion Galette: Preheat the oven to 450°F. Place a baking stone on the middle rack in the oven. (If you do not have a baking stone, preheat the oven to 425°F.) Line a baking sheet with non-stick aluminum foil. Carefully cut the onions into ¼-inch thick slices. Hold each slice so that the rings stay together. Stack the slices on a plate so they are ready when you assemble the galette. Sprinkle the dough with the ground almonds. 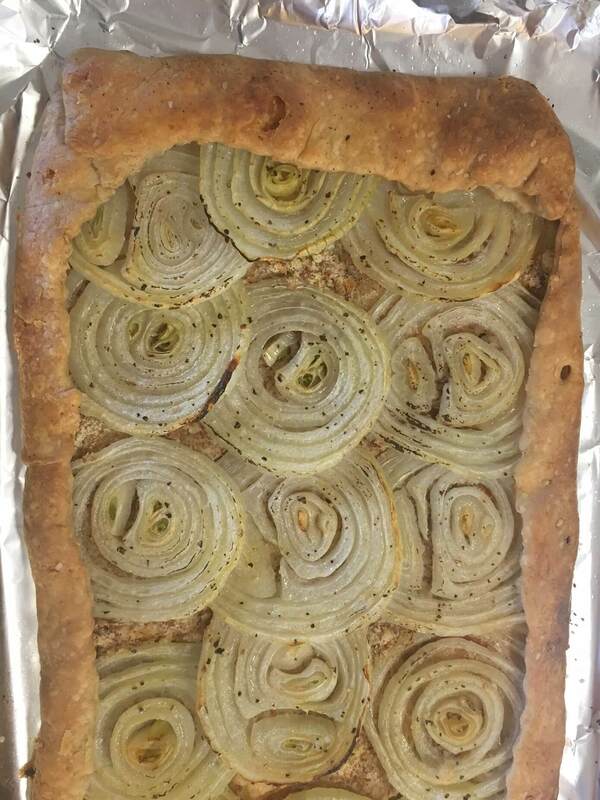 Place the onion slices slightly overlapping in rows covering the dough. Leave 2 inches of dough along each edge uncovered. Fold over the edges of the dough to make a neat edge. Brush the onion slices with olive oil. Season with salt and pepper. Bake until the onions are lightly browned and soft and the crust is crust and cooked through for approximately 35 to 40 minutes. Cool the galette on a wire rack before serving.